PHOTO BY EMILIE JONES/GLEANER NEWS: Seaton Village’s Karma Co-op celebrates 45 years on June 24. 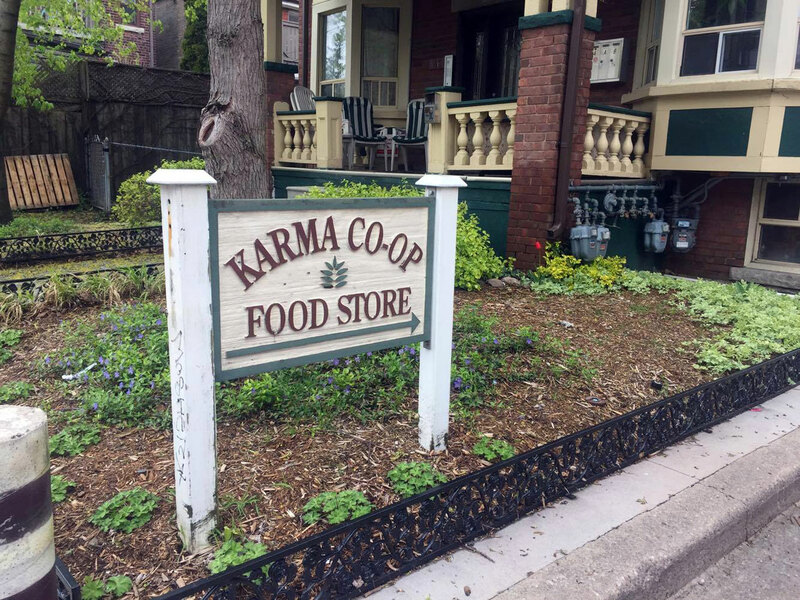 In our fast-paced, busy world, Karma Co-op has managed to stay true to its philosophy of creating a tight-knit community built around sustainable food. Although there have been changes since it was founded 45 years ago, Karma’s ideals continue to revolve around the people: their wants, their needs, and their produce. This is what Karma prides itself on. Its members see food as more than simply something we eat. While Karma’s focus used to be on selling bulk products to reduce packaging and associated waste, it has progressed to accommodate a variety of different dietary needs including organic, gluten-free, and vegan. That philosophy is underscored by its co-operative nature. To be a member of Karma, people must volunteer to work two shifts a month in the store. This leads to a real sense of community, where shoppers and customers are interchangeable. Similarly, James Byrne chose to work at Karma because he likes the feeling of community and getting to know members, who in turn help to determine what the store sells and how it works. Since Karma is much more than a store, the people who shop there are hardly customers. Everyone is equal, and everyone helps one another. Being part of the Karma co-op means having stimulating conversations about the politics and ethics of food consumption, and a variety of other topics. These conversations can happen one-on-one while getting groceries, but also at guest lectures that are open to the wider public. It’s very much at home in the active community of Seaton Village, a hidden location of sorts that is not without some challenges. “[The location] is both a blessing and a curse,” says manager Talia McGuire. “It is a hidden gem, so people feel like they’ve discovered something awesome, but there is no walk-by traffic.” However, as McGuire notes, gross profit is not what Karma is after. Nonetheless, Hunter explains that Karma does struggle with “how to stay true to its vision and still be commercially valuable”. This is why Karma has made some changes in the 45 years since it was founded, such as the different tiers of membership types. Instead of volunteering hours, people can pay a fee to shop at Karma. There are also trial memberships, which allow people to access Karma as a member for one month before deciding if they would like to continue. There is also parental leave, vacation leave, and pay per quarter. In other words, Karma does its best to be flexible and not make members feel permanently obligated. “In a super crazy, busy world that can be intimidating, where we don’t stop to smell the roses, Karma is a moment where you can take a breath,” says Hunter. And on June 24 the community will gather to celebrate the co-op’s forty-fifth anniversary. Various co-ops will be in attendance, including Together We’re Bitter, the brewery providing beer for the occasion, and Urbane Cyclist, which will offer free bike tune-ups. Speakers will include Karma’s founding president and Cressy.